Code: a system of letters, numbers, or symbols into which normal language is converted to allow information to be communicated secretly, briefly, or electronically. AMF has taken this to the extreme. By plugging the necessary components into their Ball Path Simulator, they were able to generate a series of numbers - a Code or formula. The results equated to a code that once deciphered, gave them the ideal ball reaction for today''s lane conditions. Applying geometry and physics to develop a core and cover combination that best matched up to the required code. 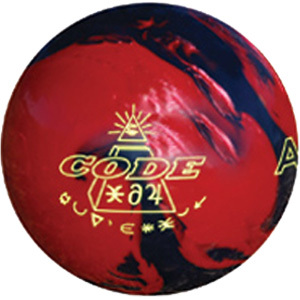 The Code produces a powerful, forgiving mid-lane ball path motion with a continuous arcing reaction at the breakpoint. The new AMF CodePlus™ Reactive coverstock provides the traction, while the new core design provides the motion for outstanding performance with control. Stats are in profile. Check back for a photo. I picked up a 15lb code two weeks ago. I drilled the ball with a 4 X 4 layout and a 2.5" pin buffer. This put the pin just above/right of my ring and cg out with a small weight hole. I left the ball with the box finish, polished. I have had the opportunity to throw the code on a variety of oil patterns (all on AMF HPL synthetics), ranging from a standard medium oil house shot, to several of the PBA patterns. House shot is a 39' top hat pattern, and PBA shots have been cheetah, Viper, Chameleon, and Shark. My first experience with the Code was on the house shot. For me, the ball is nothing short of phenomenal. Easy length through the heads and a strong, but controlled movement in the backend. I am able to line up at 21-23 on the approach, swing the ball across the 2nd arrow out to around 3-4 at the break point and seem to carry almost everything. On shots that get to the dry early, the ball doesn't seem to over react. On tugged shots, the ball holds its line. What's really impressive about this ball is that my adjustments have been cut in half. Usually over the course of a 3 game league night, I will adjust my feet anywhere between 15 and 20 boards left. Over the last two and a half weeks, the most I've moved has been 8 boards. That means less adjustments, staying lined up longer, and striking more. Last weekend, I finished a no-tap tournament (all our local house runs) with a natural 278 game, followed by a natural 300 game. Some of the best scores I've shot in years. On the PBA patterns, the Code has performed surprisingly well over a variety of conditions. On the cheetah, I was able to line up playing straight up the ditch, targeting the 2 board. Due to the volume of oil, I will generally need a medium ball with some surface, or a stronger ball with a little polish. The Code rolled very well here for me. The only time I ran into trouble was with big tugs inside (3-4 boards).. but that was expected from any ball. A little push outside (didn't have much room playing 2), came up without any troubles. On the Viper, I ran into a little over/under initially. I started out playing 12 to 5 and had a reasonable shot. This disappeared fairly quickly, so moved both feet and target inside 3 boards to try and catch a little more oil up front. Here the ball wanted to jump early. If I moved my feet inside, but kept my target the same (just a couple board move with my feet), then the ball would hang a little. After fishing around for a few frames, I moved back outside with a little more speed and seemed to have found a reasonable line. This is no surprise to me as the Viper has always been my toughest pattern though. On the Chameleon (second toughest pattern for me), I also struggled. Not so sure it was the ball, as much as me. I was able to get a line playing straight up 11-12 board. Strong consistent roll when I hit the line, but a little over/under for me when I missed. Finally, I threw on the Shark pattern. For me, this is one of my favorites, simply because there is oil. I wasn't sure that the Code would be strong enough for this pattern (especially being polished), but I though I would give it a shot anyways. Surprisingly, I was able to play a tight inside line to the pocket and found excellent carry. Lining up at about 25 on the approach, I was able to cross 15 at the arrows, and push the ball out to around 12-13 down the lane. With a little slower ball speed and more of a forward roll type of release, the Code just revved up and made a little move at the end of the pattern. It must have saved up a ton of energy as I had messengers galore. I bowled all three games of league playing this line and never was forced to move. Overall, a very versatile ball that seems to play well on a variety of oil patterns. I think the feature that stands out the most is the strong, but controllable move of the ball on the backend. If I only had one ball to use for all of my leagues/tournaments, this would be my choice, hands down. Great performance, great looks (love the red/black color combo), and a very reasonable price. If you have any Q's, please contact me. "The haddock hits me with a sucker punch. I catch him with a left hook. flat as a mackerel, kelpless." Ball spec's 15.3 3.5" pin 3 1/4" top & 15.2 3" pin 3 oz top. My profile: speed 15-17mph, power stroker rt hand. Lane surface, wood, overlays and AMF synthetic. Drillings: 4 X 4 with 2000 abralon and 5" pin OOB surface. The NEW AMF Code is a keeper! I wound up drilling 2 and each ball really has a different look. First I tried a pin up 5" pin with the polish OOB surface. This thing really cleared the heads for me, revved up in the midlane and turned the corner with a hard arc/flip. Very nice look on broken down patterns when I have to move inside and swing. The ball is easy to read and carries the light shot extremely well. Compared to my Heist it's more of a skid/flip ball. It doesn't roll quite as early BUT it's more of a coverstock issue when comparing the two. The Code does make more a pronounced move at the breakpoint than the Heist though. My second Code I drilled with a standard 4 by 4 and knocked off the shine with a "dead" 2000 abralon pad and WOW now we had an aggressive ball that turned the corner on oil/carrydown. In this state the Code still didn't hook as early as my Heist but it gave me more room to miss right and it recovered extremely hard! The Code has plenty to offer - good roll, good backend and great carry! It loves to blow out the half-hit! It is a very versatile ball that can be sanded for more hook in oil. Give this one a try - the price tag might be small but the results are high!! I drilled this ball a few weeks ago on advice of my ball driller. I was to be close to the Track Phoenix in reaction and hit. I went out and used it and was very disappointed. I was told it would never roll out for me but I got it to roll out at about 45 feet every time. I did try to shine and dull the cover and all I got out of that was very flat corner pins as the ball was DOA in the pocket every time. This ball ranks as one of my least favorite balls of all time. Just a first impression on this ball. I picked up one of the long pin 2nds Tekneek was selling about the time of my foot surgery in march. 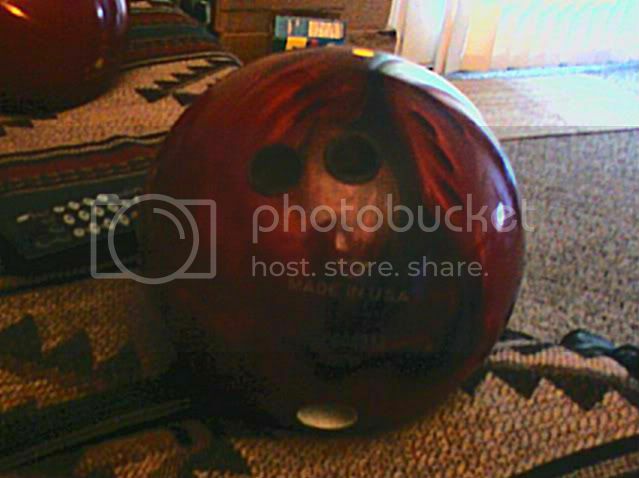 I drilled this ball with 5" pin to pap. 50 degree drilling with a 2 1/2 inch pin buffer. I threw this ball last thursday night on a broken down cosmic bowl shot.This ball cleared the heads with ease, picked up a nice midlane roll and arced smoothly into the pocket with good continuation through the pin deck and great carry. Keeping in mind that this the first time out in 3 plus months and i'm wearing an orthopedic boot/cast that goes up to my right knee ,my timing and release sucked. This ball offered me a great look and mistake area on what is normally a difficult condition with my slow speed. I will be drilling a 2nd Code tomorrow pin under and will report when i start getting some games under my belt. Great piece from the people at AMF 5 stars! Pin to PAP - 5"
CG to PAP - 3.5"
Dislikes - a good benchmark, keep it in the bag for heavy oil. Check out www.springerrescue.org and help save the life of an English Springer Spaniel! Ball is drilled pin under ring with the double thumb lay out.It may be the drilling but no matter were the ball enters the pocket it leaves something on the back line.It hits hard and has good movement but it leaves single pins all nite.Like the way it rolls and the hitting power but shooting single pins all nite is not something that I find enjoyable. FINALLY got around to doing a review for this ball. Got it from Tekneek, and it is a long pin second. Surface-Light polish over OOB finish. This is one amazing piece. It was drilled as an experiment, but I have ended up with a ball that goes cleanly through all but burnt up heads, yet reads the breakpoint well, and has one of the strongest arcing reactions I have seen. From shot to shot, it is one of the most consistent reactions I've been able to get in a LOOOONG time. This ball works well on everything I have found except extreme dry, or excessive carrydown. On the dry it does read early. On the excessive carrydown, it still hits the pocket, but pings more corners than otherwise. All in all, I'll be sad to see this one wear out. You can bet it gets all the maintenance it needs to prolong its life as far as possible. I know it's been discontinued, but, if you bowl on medium to heavier conditions, don't be afraid to try one of these if you have the chance, it's really a great piece.